YstokGrid is a GUI library, which facilitates rendering and editing tabular data. This widget is Lisp implementation-specific and targeted at LispWorks®, a Common Lisp development system for Macintosh, Windows, and Linux platforms. The grid (aka screen table or datasheet) was actually tested only on Windows. It is based on CAPI and does not require any DLL or OLE components. Text choice and option choice columns. 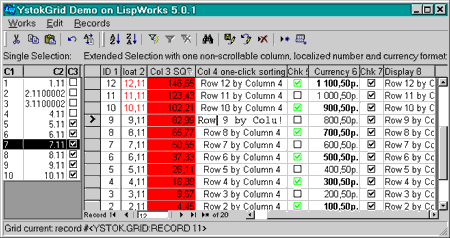 More column types based on various CAPI panes for editing, for example, text-option-column, text-choice-column, and date-column. Saving and restoring user preferences: values of row height and column widths (including the header row and column), grid searcher coordinates, editing pane font for text-input-column, the Enter key behavior, and the like. Clipboard functions for data exchange with other applications. Context menus popped-up on the :post-menu gesture. Optional SQL-Grid module interfacing relational databases via ODBC (requires YstokSQL). The look and feel of YstokGrid Professional can be tasted in full with the demo-version of Ystok-Tournament. We usually provide our customers who program in Lisp with the source code of YstokGrid Professional under a special license agreement.